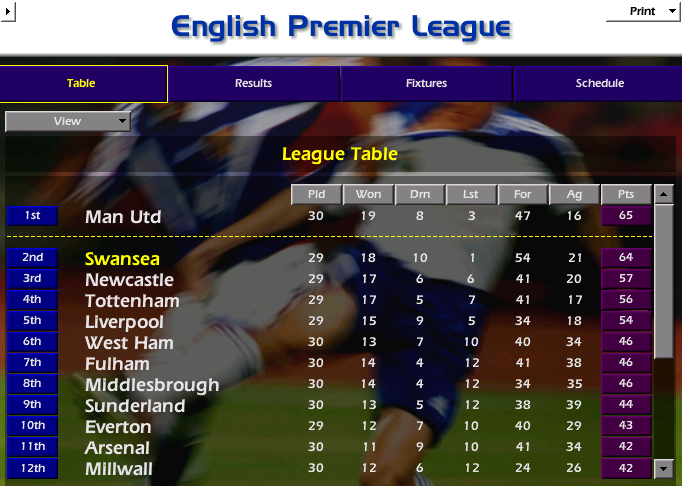 Away to 9th placed Sunderland! 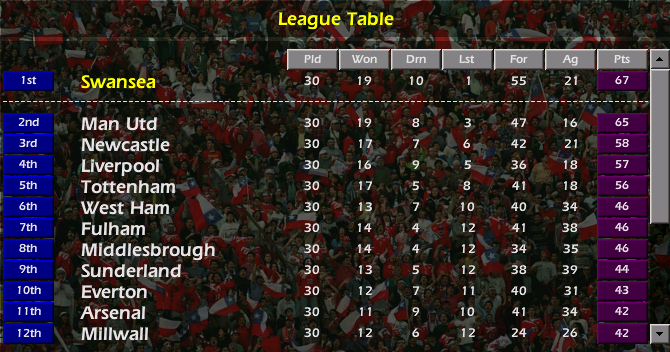 They are only 2 points from 6th so will be a tough game today! No game for a week so strongest XI available will play! 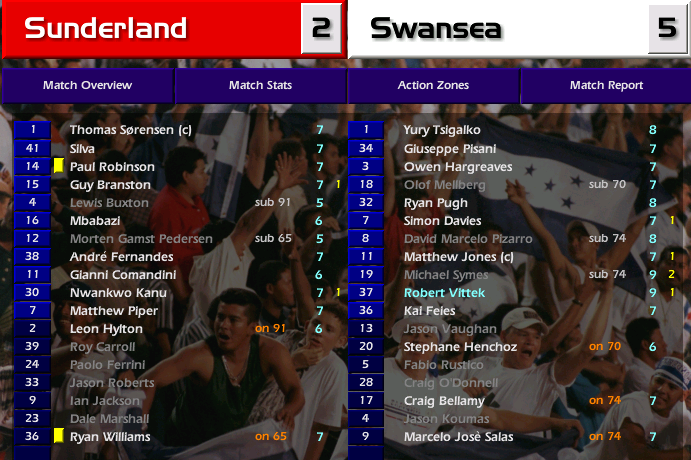 "Bonkers, bonkers game, but Swans pull through in the end!" Amazing first half full of goals – FIVE of them in fact! Pugh’s free kick falls into Matthew Jones past who goes on a lambasting run and scores his first goal of the season! But we’re pulled back to 2-2 as Sunderland score from their free kick as Branston beats the keeper to the ball! But before HT we go 3-2 ahead Pisani’s low cross is tucked away by Symes! The game is now in our control and we put gloss on the scoreline in 71st minute as Vittek scores with a fine free kick strike! In the game of the weekend, 10 man Utd and Liverpool draw – dropped points for both is nice! Redders: Yes – feck knows what was going on in that first half – pinball and who could outscore each other! Reporter: In one way, that a welcome relief though that you are regularly finding the ack of the net again? Redders: There was a spell where the front lads were missing something but now we have Symes back on form BIG TIME, Vittek has made an immense start, Keane always gets his goals and Salas is always lethal. And that’s not forgetting Tevez who has been improving as the season goes on! Reporter: And news just in that Utd and Liverpool draw – thoughts? Redders: Well, all we can control is what we do. We’ve drawn too many games this season but we have only lost 1 game in 20 leagues games this season! Reporter: Good luck for the rest of the season and thanks for speaking to the Echo! Must've been one helluva game to watch! And Man Utd dropping points again! Although that was Liverpool, of course. Man U dropping is niiiiiiiiiiiice - are they bottling it? You still playing this whilst on holiday? No trouble at all picking up wins again now. Bonus that Man Utd have dropped points, let's get that game in hand won! Yeah - have had to do a bit of work so had a few games for this story! Things are going nicely at the mo - let's hope it continues towards business end of the season! Away to 4th placed Spurs! 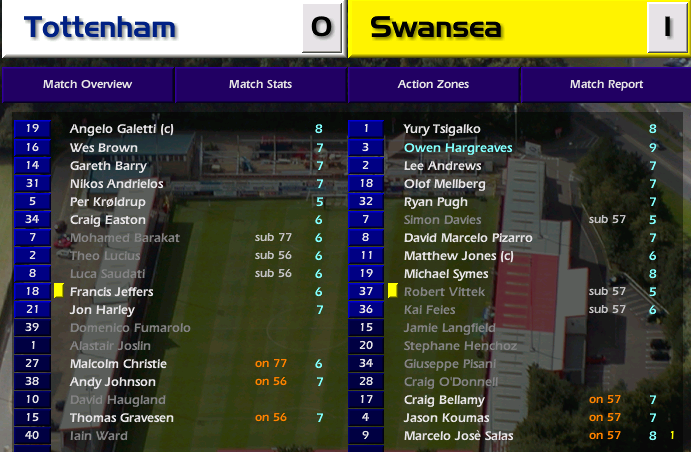 "The old guard make a difference from the bench to hand Swans the points in a nervy encounter at White Hart Lane!" Blimey – Spurs come out all guns blazing and look to attach from the off! 2nd half starts badly for us and Vittek, Feies and Davies are all replaced by Salas, Koumas and Bellamy – some may say the “old guard”……..
We go top of the league winning our game in hand and surely it’s a 2 horse race now? 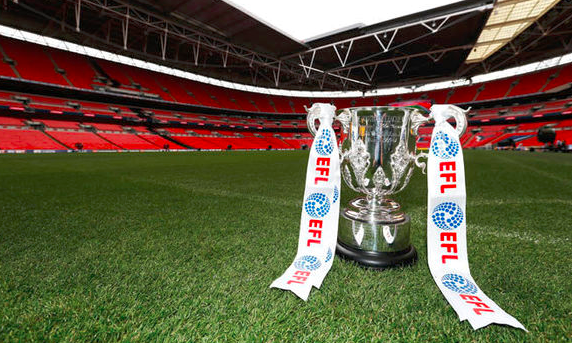 Next up is this………………LEAGUE CUP FINAL! The final lap is approaching quickly! It is a two-horse race indeed.